Cugoano is a late bloomer to seriously writing poetry. He tends towards realism in his poetic style. His desire is to create a poetic legacy for his adult children and grandchildren. 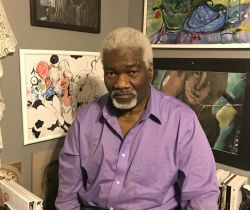 After achieving a doctorate in clinical psychology, he brings both his life experiences growing up in Detroit, Michigan (USA) and his perspective as a psychologist to his poetry. I like this poem a lot. How innocent we are and how fast that disappears….. This is such a sensitive poem about how vulnerable and impressionable our young are. Great poem, Cugoano. Captures childhood’s innocent creative spirit brilliantly. Great poem. Your twist on the ending is powerful. I bet that lunch box would be worth something today if it was the original mint. Imagination rules in the heart of every child. It’s closer to knowing the inner self than the adult will ever know unless they are taken back to that place in time. My cowboy heros were Roy Rogers and Red Ryder. Red Ryder was advertised with daisy Red Ryder B B guns. Started with Cracker Jack comics I think. Like Roy Rogers the storyline went into movies too. I even had a daisy air rifle back in the 1950’s.